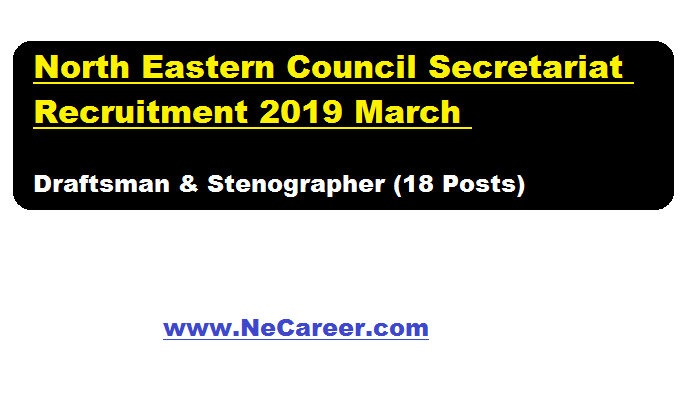 North Eastern Council Secretariat Recruitment 2019 March - Draftsman / Stenographer (18 Posts) :- Welcome to North East India's No. 1 Job Portal NeCareer.com .The North Eastern Council Secretariat is looking for the services of suitable officers for filling up the posts of (1) 01 (one) post of Draftsman Grade I and (2) 17 (seventeen) posts Stenographer Grade II on deputation basis. The details of the posts, eligibility criteria, job requirement and experience required for the posts are mentioned in below section. Note : The pay and other terms and conditions of deputation will be regulated in accordance with DoPT O.M. No. 6/8/2009-Estt. (Pay-II) dated 17.06.2010 as amended from time to time. Cadre authorities/ Heads of Departments are requested to forward applications of eligible and willing candidates whose services can be spared on deputation immediately on selection so as to reach the undersigned within 60 days from the date of publication of this advertisement in the Employment News [Issue no 52, 30 March-5 April 2019 ]. Interested and eligible Candidates may send their application in prescribed format which will be downloaded along with the advertisement. List of Enclosures to be Accompanied with the Application /certificates to be given by the office/Department while forwarding the Application.